imagine this. a swarm of international artists is sent out alone on an island. how do they communicate? what language do they choose? strangely enough they find out that there is no common language among them. A basic set of words is needed. A basic language structure should follow, including a vocabulary particular to the items and tasks at hand. 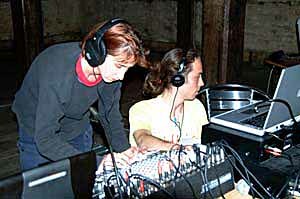 this has been solved through various sound & speech recordings along the way and was presented as a live radio event at the Solar Circuit Festival in Hobart, Tasmania and streamed LIVE-to-AIR on Radio FRO (105Mhz in Linz, Austria) and Radio Orange (94Mhz in Vienna, Austria) on February 14th, 2002, 6 pm local time Hobart / 8 am local time Vienna / 7 am GMT . Andrew Burrell, Lester Chan, Jody Chime, Ian Clothier, Nina Czegledy, Etienne Deleflie, Katherine Gadd, Ken Gregory, Amanda Hendricks, Antoanetta Ivanova, Megan Jones, Andrew Lawrence, Sophea Lerner, Tapio Makela, Wade Marynowsky, Maria Miranda, Kaoru Motomiya, Norie Neumark, Tulle Ruth, & Sarah Waterson.